Zip On Dvh - Lightweight Jacketing - Wire And Cable Bundling - Products - ZT | Zippertubing Co.
0.375" 0.5" 0.625" 0.75" 0.875" 1.0" 1.125" 1.25" 1.375" 1.5" 1.625" 1.75" 1.875" 2.0" 2.125" 2.25" 2.375" 2.5" 2.625" 2.75" 2.875" 3.0" 3.125" 3.25" 3.375" 3.5" 3.625" 3.75" 3.875" 4.0"
This time tested solution is available in 20mil thickness DVH-20 available in a large assortment of color and size options. Zip-On® (DVH) combines two heavy-duty solutions into one flexible rugged cable bundling jacket. Utilizing Zippertubing's DVH-20 or DVH-40 PVC impregnated Polyester fabric, this jacket solution provides excellent abuse, abrasion and wear resistance across many industries. This solution also features your choice of track closures such as our D-Track-LT externally closed pressure track, which not only is very practical and economical, but substantially increases the ease of installation. This time tested solution is available in 20mil thickness DVH-20 available in a large assortment of color and size options. The Zip-On® (DVH) is also available in a thicker 40mil DVH-40 which provides extra abrasion protection where needed but is only available in black. These outer jackets are ideal for a large assortment of applications from hose abrasion protection to under water umbilical bundling. The Zip-On® (DVH) has a temperature range of -30° to 82°C when combined with D-Track-LT and for lighter duty applications utilizing Z-Track closures -20° to 82°C. The Zip-On® family of cable management products are as easy to install as they are to re-open. Whether you are in the field or in the office, the convenience and functionality of Zippertubing&apos;s Zip-On® solutions will more than satisfy your cable bundling and protection needs. These products are available in a variety of materials, colors, shapes and sizes. Any of the Zip-On® pressure tracks are easy to install on your application thanks to the available plier and slider tools. The plier tools are great for long cable runs, while the slider tools are better for those shorter cable runs. Refer to Zippertubing's DVH data sheet below for specific material characteristics. Please contact us for custom needs. We have a solution for you! Cable Diameter 0.375" 0.5" 0.625" 0.75" 0.875" 1.0" 1.125" 1.25" 1.375" 1.5" 1.625" 1.75" 1.875" 2.0" 2.125" 2.25" 2.375" 2.5" 2.625" 2.75" 2.875" 3.0" 3.125" 3.25" 3.375" 3.5" 3.625" 3.75" 3.875" 4.0"
DVH-20 is a 20-mil thick PVC impregnated Polyester fabric which provides a tough, yet flexible outer jacket for wire and cable protection. Ideal for outdoor use where cables are exposed to abuse, abrasion, rock impact, or where good wear resistance is required. DVH-20 is available in many colors for applications requiring color-coding, can be constructed in round, flat and rectangular cable configurations and utilizes numerous closure styles. The material is flame retardant and has an operating temperature range of -30 to 85°C. Fluid Resistance Hydro Resist 225 psi. 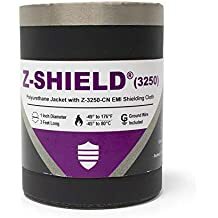 The Z-Track closure is a medium size Arrowhead & Channel interlock design approximately .150" wide and is the most versatile closure offered for Zip-On jacket applications. It should always be considered as the first closure choice when designing a wrap-a-round jacket system. Z-Track is extruded from flame retardant Polyvinylchloride polymer. The standard track color is black, which can be utilized with all PVC based jacket materials and can also be special ordered in clear for large projects. Ideal Application Round jackets <4" in diameter that require a strong and flexible closure. Specifications subject to change without notice. All statements and technical information contained herein are based on tests we believe to be reliable, but the accuracy or completeness is not guaranteed under all circumstances. 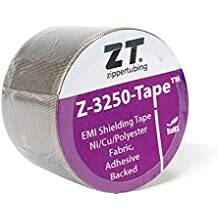 Before using Zippertubing® products, the user shall determine suitabilituriy for the intended use, and user assumes all responsibility for improper selection. Published attenuation values of Zippertubing® shielding have been verified by laboratory testing of the respective shielding materials. Actual installed attenuation values may differ due to installation techniques and final assembly operation parameters which are beyond the control of Zippertubing®. Actual attenuation values can only be determined by the end user testing the completed assembly. U.S. and International Patents and patents pending. © 2019 The Zippertubing® Company, Chandler, Arizona. Speak to an Engineer Today! We have highly experienced and friendly engineers on site ready to assist you in all your projects. Interested in new Products and Custom Solutions? © Copyright 2019 Zippertubing® Co. All Rights Reserved.